Such a lovely combination & they look securely wrapped too (always have to be careful to check with this kind of piece). So beautiful. Such a lovely combination & they look securely wrapped too (always have to becareful to check wit this kind of piece). So beautiful. Beautiful earrings in a beautiful color! I can’t wait to get my hands on a pair. Here are some other gorgeous Spring pieces I’m sure everyone will love http://amberbeata.com/blogflowermotive-18.html and http://amberbeata.com/blogamberpendant-15.html. http://amberbeata.com/ is the perfect place for statement jewelry! I didn’t really need them. They might be ugly in-person (so to speak). Maybe they’re heavy, or uncomfortable, or not real gold. 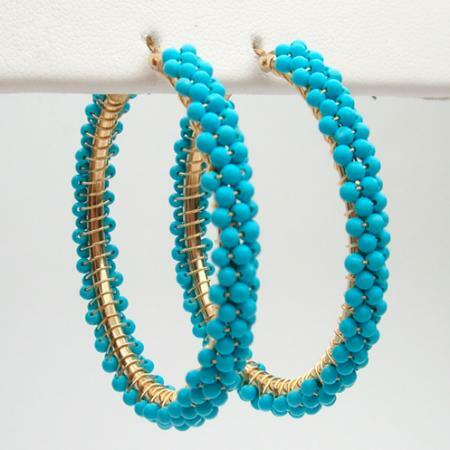 Turquoise certainly does say spring! These are some beautiful earrings. Lovely earring and great colour! Dont blame you for falling victim to these! These are lovely, I dont blame you for falling victim to your sneaky credit card day dream! Great writing style! Ahhhh… bikini… Hawaii…Piña Colada… Those earrings are really great!